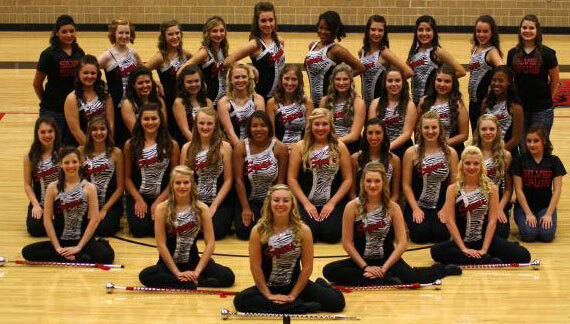 The 2014-2015 Silver Spurs had 32 members. The team was led by Captain Haylii Baylis, 1st Lt. Stevie Burns, 2nd Lt. Madison Ross, Sr. Lt. Erinn Killingsworth, and Sr. Lt. Annie McTighe. The theme for the year was "Having the Time of Our Lives," and was created by Stevie Burns. The highlight of the year was a trip to Los Angeles, California to perform in Disneyland! This was the first year for the Silver Spurs to host the Showtime International Texas Dance Challenge. The Spurs competed, and won Best in Category in Team Production (Hunger Games) and Officer Hip Hop at Showtime International's Lewisville competition. Both the team and officers won Circle of Champions. Haylii Baylis won Senior Solo Champion at the Raising the Barre competition at Martin High School. The JV team swept every category, as did their officers, and won Grand Champion team and Circle of Champion officers. The JV officers were Captain Abby Lodrigues, Lt. Mia Williams, Lt. Alex Corpus, and Lt. Ally Accipiter. The JV officers also won an award the first night of officer camp for Leading Full Circle. Haylii Baylis won the drill down competition at team camp at Martin High School. Nadia Gracia was named to the All-Star Kick Company. Ally Accipiter, Madison Ross and Haylii Baylis were named to the All-Star Jazz Company. 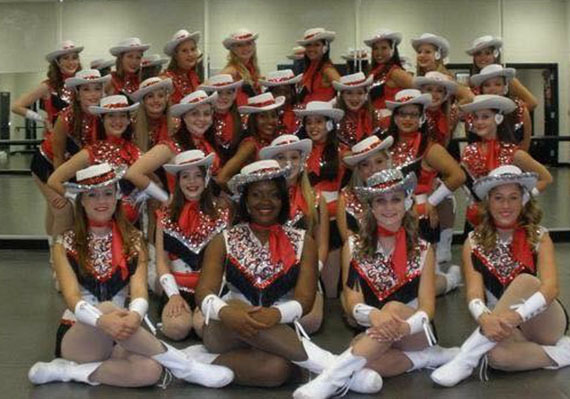 The 2013-2014 Silver Spurs had 35 members. The team was led by Captain Marissa Bergere, 1st Lt. Haylii Baylis, 2nd Lt. Taryn McCarty, Sr. Lt. Alejandra Perez, Jr. Lt. Stevie Burns, and Jr. Lt. Madison Ross. The Legacy Broncos Football team had their best season ever, and the Spurs got to perform at Texas Stadium. This was a competition year, and the team and officers won Grand Champions at Showtime International's DeSoto competition. Marissa Bergere and Haylii Baylis were solo finalists at competition as well.This was also the first year of the JV Silver Spurs with 22 members! They were led by officers Aubree Sutphin, Miranda Henson, Heather Brown, Brittney Tworek and Annie McTighe. Miranda Henson won the drill down competition at team camp at Martin High School. Marissa Bergere was named to the Kick Company and Jazz Company. With Legacy’s fourth year came a Silver Spur team of 25. Captain Alicia Perez, 1st Lt. Gena Newcomb, Sr. Lt. Bianca Martinez and Soph. Lt. Jacy Hinkle led the team. The team debuted a new performance top, the zebra “Spurs” top. The Spurs continued traditional performances at football games, pep rallies, basketball games, dance recitals, and held their annual spring show. 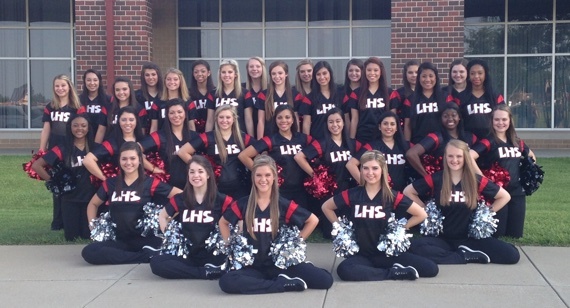 At competition, the officers and team were awarded sweepstakes, and the team won Best in Category for High Kick. The team trip was to San Antonio for fun at Fiesta Texas and Sea World. The Spurs held the 2nd Annual Jr. Silver Spurs Clinic in February of 2011, and Bronco Dance Camp was back by popular demand in June. In the summer of 2009, the team’s second director was hired to direct the Silver Spurs. Mrs. Brooke Parlin followed Mrs. Summer Hiett, and is currently the director. The team had 15 members for its third year, and three officers. Captain Nichole Fort, 1st Lt. Sarah Daniels, and Lt. Samantha Streeter. During 2009-2010, the Silver Spurs had more firsts. The 1st Annual Holiday Show to the elementary schools was established, the 1st Annual Jr. Silver Spur Clinic was established with 80 young dancers, and Bronco Dance Camp was created for young dancers to train at during the summer. They competed for the first time, winning sweepstakes for team and officer, as well as Best in Category for Team Novelty and Team Jazz. The officers debuted their competitive legacy as Grand Champions! Another exciting moment was when the team performed in the Orange Bowl in Miami, FL. History shared by former Silver Spur Director, Summer Klund Hiett, 2007-2009. The First Line picked the name "Silver Spurs." It was an idea originated by our first Captain, Cameron Skoczlas. During summer practices in June 2007, before Line Camp, we had a meeting about creating traditions and deciding the beginning of the 'Legacy' of the team. We did some brainstorming during those first meetings on those topics. Officers were picked for the team back in late April of 2007 before the school opened, and the team was picked in early April 2007. The team's first director, Summer Klund Hiett, designed the uniforms during our first Officer Camp. The officers and team were involved with most decision making and tradition making that went on. First Line had 17 members.